The debate over federal funding for "green energy" companies has been revived by A123 Systems' bankruptcy filing. 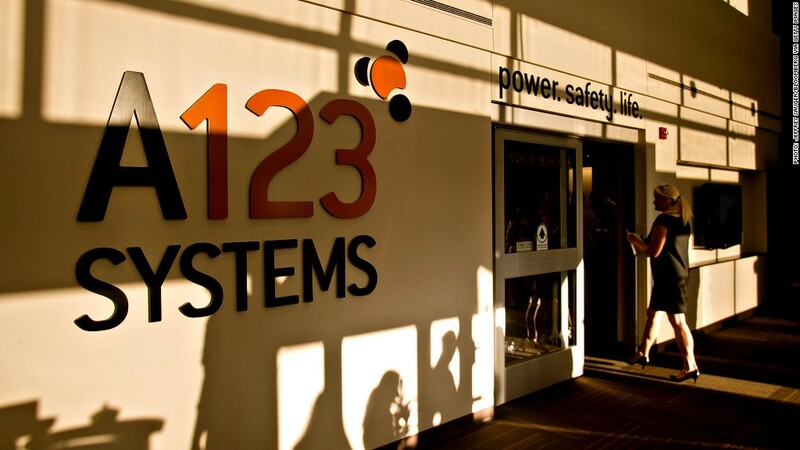 Battery maker A123 Systems, a one-time darling of the U.S. electric car industry and recipient of millions in government funding, filed for Chapter 11 bankruptcy Tuesday. The filing highlights the controversy over federal subsidies for "green energy" companies that has been a part of the 2012 presidential campaign. A123 (AONE) has $144 million in debt and missed a $2.7 million interest payment on Oct. 15. In 2009, A123 received $249 million in federal funding for advanced battery technology manufacturing at two sites in Michigan -- Romulus and Brownstown. The funding was part of $2.4 billion in stimulus funds designed to jump start advanced vehicle manufacturing in the United States. A123, based in Waltham, Mass., manufactures lithium ion batteries for electric cars. A123 sprang out of research labs at the Massachusetts Institute of Technology in 2001 and was founded with $100,000 in seed money from the U.S. government. Its advanced batteries were once hailed as the American answer to a sector largely dominated by Asian firms. The company had a high-flying debut on the U.S. stock market in 2009, with its shares surging over 50% on its first day. But demand for electric vehicles has not materialized as fast as some had hoped. The weak economy has hurt, as has the high cost of electric vehicles. The A123 filing follows the bankruptcy of at least four other companies that received government money under Obama -- Battery maker Ener1, energy storage company Beacon Power, and solar panel makers Abound Solar and Solyndra. Its bankruptcy provides fodder for Republicans critical of President Obama's funding for alternative energy companies. Republican presidential candidate Mitt Romney seized the opportunity. "A123's bankruptcy is yet another failure for the president's disastrous strategy of gambling away billions of taxpayer dollars on a strategy of government-led growth that simply does not work," Romney spokeswoman Andrea Saul said in a statement. Adam Fletcher, campaign spokesman for President Obama, replied, "Romney is again hypocritically hiding the truth: He picked his own winners and losers with taxpayer dollars as Governor of Massachusetts, loaning millions to two companies run by his donors. They later defaulted on those loans, leaving taxpayers with the bill and eliminating jobs." A123 Systems said it has reached an agreement to sell its automotive assets to Johnson Controls (JCI) Inc., an auto parts company. The company's bankruptcy filing comes just two months after Chinese auto parts maker Wanxiang Group Corp. announced plans to invest up to $465 million in A123. That deal sparked controversy at the time, with some lawmakers questioning a Chinese company's involvement in A123, which had over $20 million in contracts with the U.S. military. Critics say the government does not have the expertise to pick winners and losers in the fast-moving alternative energy sector, and should restrict its funding to basic research. Obama and others say this funding is crucial to support small companies that are competing against energy giants in the fossil fuel industry, which have often enjoyed decades of favorable government policies. They also note that most of the companies the government has funded are still going concerns.